Burmese political blogger Nay Phone Latt was jailed for sharing news online about the monk-led saffron revolution in 2007 against the country’s brutal military dictatorship. Released under an amnesty for political prisoners three years ago, he is involved in another kind of revolution, one against hate speech targeting Muslims that is becoming more and more prevalent in Burmese society. The internet in Burma was once among the most restricted in the world but, since the lifting of censorship, people can now access whatever they want. Internet availability is still scarce but, with telecommunications infrastructure developing at a fast pace, many use the internet via mobile phones. Social media, especially Facebook, has become a popular way to discuss politics and share views and opinions, something not possible before. However, not only has it led to greater political debate, it has also lead to an outpouring of hateful and racist sentiment towards Muslims who make up about 4 per cent of the population. From a modest building in a quiet leafy Rangoon neighbourhood, he and his civil society group Myanmar ICT Development Organisation, in collaboration with other activist groups, operates a campaign to counteract hate speech online. Called Panzagar (flower speech), their slogan is “not to spread hatred among our society; be careful of your speech”. The campaign symbol is a flower in a mouth and they encourage supporters to take a selfie with a flower and post it to their Facebook page.The campaign also reaches out to people not online through posters and DVDs in remote areas. Religious tensions have been rising in Burma in recent years, since the outbreak of sectarian violence against the Rohingya Muslim minority in Rakhine state in the west of the country. More than 240 people have been killed and 150,000 are displaced and living in camps as a result of the violence. The tensions have spread to other areas in Burma, with rioting and violence in Mandalay in July last year and in Meiktila in central Burma in March 2013. Anti-Muslim sentiment has spread, spearheaded by an extremist Buddhist group known as 969 and led by controversial monk Ashin Wirathu. The group claims it is protecting the country from Islamisation and calls on Buddhists to boycott Muslim businesses. Social media has played a role in stoking violence. The riots in Mandalay broke out after unverified rumours circulated on Facebook that a Buddhist woman had been raped by a Muslim man. Wai Wai Nu, a political activist and member of the Rohingya Muslim minority, said that despite claims by some monks, there is no history of Islamic extremism in Burma. “Muslim people in Burma, whether they are Rohingya or others, they are peaceful people. They have no history of violence or attack,” she said. The government has been accused of not taking enough action to quell the tensions. Towards the end of last year, controversial legislation, known as the protection of race and religion laws, was submitted for parliamentary debate. The legislation was proposed by another extremist Buddhist group known as the Mabatha and, while it was tempered by a parliamentary committee, the current draft still includes some restrictions on interfaith marriage, religious conversion and population control. Rangoon, a multicultural city where members of different religions have lived side by side for many years, has not seen any religious violence. However, anti-Muslim sentiment is apparent and tensions have increased. 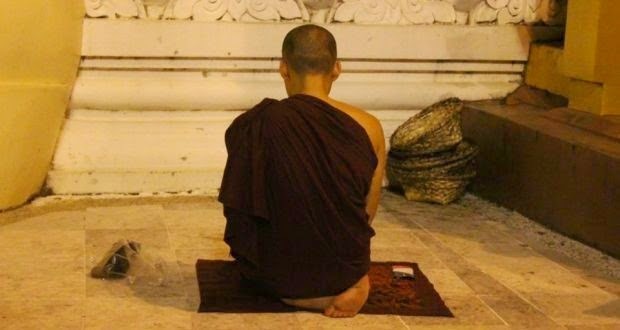 “If you are Muslim, Buddhists won’t rent houses or apartments to you and don’t buy or sell from you. This is because of the Mabatha – their religious speech spreads around the whole country. Their campaign is widespread,” says Wai Wai Nu. In the Tamwe township, a Buddhist and Muslim neighbourhood border each other. While there have been no incidents, there have been some tensions, particularly when violence has broken out in other areas. In the Muslim Ma U Gone Lan Kyal neighbourhood, three men were drinking tea at an outdoor cafe; reluctant to give their names, they say while they do not have any issues with Buddhist neighbours, monks from the 969 group “come into the neighbourhood and shout” using racist swear words. Than Than Nu owns a gold shop in the Buddhist Kyauk Myaung neighbourhood. She moved a year ago from a nearby predominantly Muslim neighbourhood because she was worried about growing tensions. Many observers suspect hardliners within the government and the former military regime to be playing a role in inflaming the religious and ethnic divisions. “We don’t know exactly who is behind the violence and the anti-Muslim movement but some critics say some people from the USDP [Union Solidarity and Development Party] and the former military government are involved,” said Kyaw Zwa Moe, managing editor of the Irrawaddy magazine. It is thought the tensions may be exploited in the run-up to an election expected this year, the first since Burma’s transition from a military dictatorship. “If some politicians want to play with it, to destabilise and to disrupt, it would be so easy to use the tensions to disrupt the political situation,” he said. This article was supported by a grant from the Simon Cumbers Media Fund.